Turkish coastguard units on Saturday rescued 16 irregular migrants and intercepted 60 others trying to reach the Greek islands off the coast of western Turkey's Izmir province. The coastguard immediately dispatched units after receiving information about a sinking boat carrying irregular migrants from Salihleraltı neighborhood of Dikili district. The irregular migrants, including women and children, included 15 Afghan nationals and an Iranian national, who were rescued as they were about to drown in the Aegean as their boat was sinking. The migrants were transferred to the provincial migration office after undergoing necessary health check-ups. 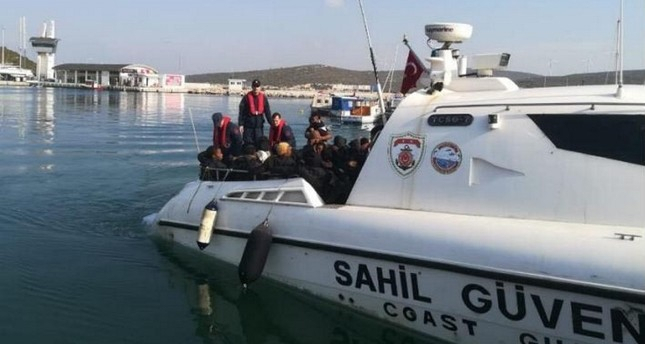 Meanwhile, in a separate operation, the Turkish coastguard also caught 60 irregular migrants trying to illegally leave the country from off the coasts of Izmir's Urla district. The irregular migrants were identified as African nationals. Turkey has been among the main routes for irregular migrants trying to cross to Europe in recent years. Some 265,000 irregular migrants were held in Turkey in 2018, according to the Interior Ministry. Turkey and the European Union signed a deal in 2016 to curb illegal immigration through the dangerous Aegean Sea route from the Turkish mainland to Greek islands. Under the deal, Greece sends back migrants held on Aegean islands after they crossed over from nearby Turkish shores, and in return, EU countries receive a number of Syrian migrants legally. The deal, reinforced with an escalated crackdown on human smugglers and more patrols in the Aegean, significantly decreased the number of illegal crossings. However, some desperate migrants still take the route, especially in winter months when a safe journey through the Aegean is nearly impossible aboard dinghies.